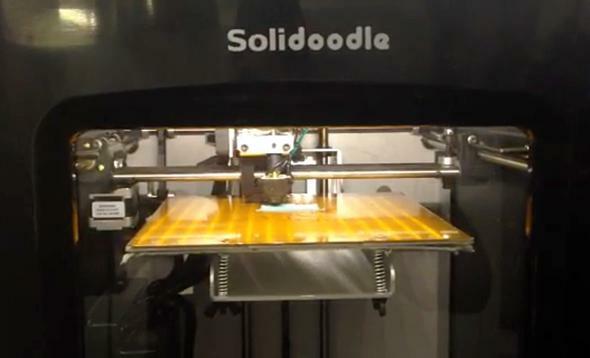 Solidoodle 4: Testing the home 3-D printer. We keep hearing that 3-D printing is the future. Very soon, it seems—like maybe in July or so?—we’ll all have Star Trek–type replicators installed in our homes. “Computer,” you’ll say, as you nibble a pastry, “please fabricate me a comfy new couch.” And lo, a sectional recliner with integrated cup holders will instantly appear. Or so goes the fantasy. How close are we to this scenario, really? Will there soon be a factory in every foyer? At-home 3-D printing is thus far a fledgling market. Companies have been racing to create printers that combine reasonable cost, compact size, and user-friendly operation. But it’s not clear that anyone’s hit that sweet spot yet. To get a sense of the current state of at-home 3-D printing, I borrowed one of the latest models. Not one of those industrial jobbies that get used by big companies, but rather a “desktop” printer designed for consumer use. When the Solidoodle 4—retailing for $1,000, and vaguely resembling an obese microwave—arrived at the Slate offices, I eagerly unpacked it in my cubicle. I threaded the spool of filament (like a bobbin of yarn, if the yarn was made of ABS plastic and the bobbin was the size of a paint can) into the printer’s nozzle. I connected the printer to my laptop’s USB port. I fired the thing up, with a whir and a hum. I assumed I’d soon be awash in an endless supply of newly conjured 3-D stuff. This last function made me acutely aware that a powerful machine was perched upon my desk. A machine capable of generating furious heat and spitting out molten plastic—which, given my lack of expertise, could easily splash about the room and end up melting co-workers’ eyes. At this point, I decided it might be prudent to call Solidoodle tech support. Within moments, an extremely helpful fellow named Joel was on the line, walking me through the setup process. He instructed me to heat the extruder (or as I’d been calling it, the nozzle) to 215 degrees. Then he had me click over to Thingiverse.com and download a simple design for a bottle opener. Confusingly, he asked if I happened to have a can of hairspray on hand. “Maybe like Aquanet?” he suggested. “The kind of stuff you might use to keep a mohawk in place?” I inquired of a nearby colleague, but she was not in possession of any hair care products. Luckily, this turned out to be noncrucial. Joel explained that the hairspray becomes necessary only if the object you’re printing is sliding around on the printer bed—some Aquanet, applied to the bed, helps stick things in place. Winging it without any styling aerosols, I sent the bottle-opener program from my laptop to the printer, clicked “Run,” and watched with glee as the Solidoodle sprung to life. The nozzle darted to and fro, extruding a thin stream of plastic with what appeared to be solemn purpose. I bid goodbye to Joel and hung up, confident I’d figured this thing out. 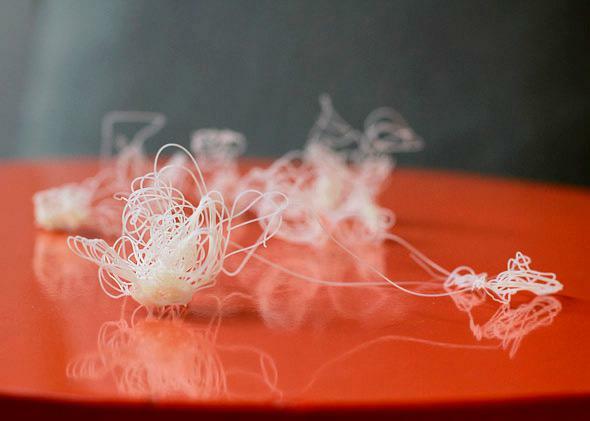 And I watched as layer after layer of carefully laid filament slowly formed … an amorphous, incoherent plastic blob. OK, a less than total success. But I wasn’t deterred. And I refused to call Joel again. I began to play around, moving the extruder on its x- and y-axis with a click of my mouse. I turned the heat back on and coaxed it up to 215 degrees. Then I noticed that my filament was snapped, and I had to rethread it. But a small piece was stuck inside the nozzle. I called Joel again. 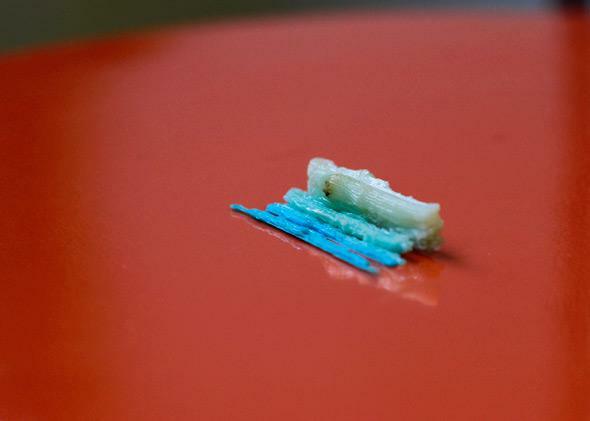 Using a pair of extra-long tweezers that came with the printer, I was able to half-melt, half-yank the filament out, rethread it, and try again. Once more, the printer cheerily jumped into action. This time I’d set the bed too low, so the plastic drooped from the nozzle with no platform to land on. Instead of a bottle opener, I ended up with a scraggly bird’s nest. I spent some time attempting to suss out where I went wrong. But after a while, I gave up. I mean, let’s say I got the printer working again. Best case scenario, I’ve melted no one’s eyes and I’ve got a new robot figurine. Woohoo. I don’t need or want a robot figurine. And $1,000 for the printer plus $43 for each spool of filament is a hefty price to pay for a functionless, semidecorative piece of plastic I could buy for like 23 cents. What’s more, the printer was loud enough that office colleagues were beginning to complain about the racket. It was emitting a smell not unlike that of burning hair. And it was taking forever to print out these objects that weren’t quite objects. 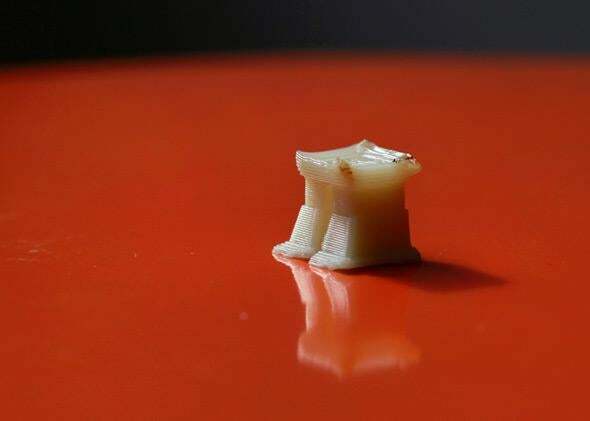 All of which points to some fundamental problems with the current state of desktop 3-D printing. Right now, even if you can tolerate the printer’s noise and stink and interminable wait time, there’s basically nothing you can make that you actually want or that is cost effective. It’s all trinkets and gewgaws. The most popular patterns at Thingiverse are pen holders and elephant figurines and flimsy, unattractive iPhone cases. OK, perhaps you can print that one little missing Ikea part you need to hold your dresser together. But only if filament plastic is a hearty enough material to do the trick. (You’re not going to smelt steel at home. Your living room isn’t Magnitogorsk.) Will an Ikea-type scenario come into play often enough to justify the substantial cost of the printer and the spools? I doubt it. Some folks might enjoy making various DIY widgets at home, as a hobby, iterating their own designs and creating new products. Bully for them. I liken these early adopters to the kind of people who were on ham radios in 1923. Until there’s a killer app for the desktop 3-D printer, though, I can’t see any reason for the average person to buy one. And I can’t yet imagine what this killer app would be. What could you manufacture at home in a manner that’s cheaper and more efficient than could be done in a giant factory? I’m open to ideas. If “customizable, personal designs” is part of your answer, remember that those designs will be limited to plastic, and that any use of wood or metal or suede will require additional procurement and assemblage, which means speed and convenience are out the window. There were very sound reasons behind society’s transition to centralized manufacturing. Consider: Once upon a time, people purchased sewing patterns (like a program from Thingiverse) and yards of fabric (like filament) and they made their own clothes. I wasn’t alive back then, but I’m pretty sure the process sucked. It took lots of time and effort and the clothes were often amateurishly constructed. Sure, consumer sewing machines got better, and made things faster and easier and more professional looking. But nowadays, save for DIY fashion enthusiasts and grandmas with lots of time on their hands, people aren’t buying many at-home sewing machines. They’re a novelty item with little practical purpose. Most people would much rather just get their clothes from a store—already assembled by people employing industrial-level efficiency and a wide variety of materials. I could be wrong. Perhaps today’s 3-D printers are akin to the cellphones of 1987. Over time, we’ll graduate from the Motorola DynaTac 8000X to the iPhone 5s—smaller, faster, more capable, and, eventually, indispensable. But I’ll bet you a pile of extruded plastic goo that I’m right.